Apart from the choice of the dual tone options, Nissan KICKS assures economic fuel consumption with its advanced 1.6 litre engine and lightweight platform. Furthermore, the Nissan Intelligent Mobility (NIM) enhances its safety features and transforms it from just a car into a driver's responsive partner. With versatile interiors, easier rear cargo access, a tire pressure monitoring system, and several stand-out elements, Nissan KICKS sets benchmarks in the compact crossover segment. 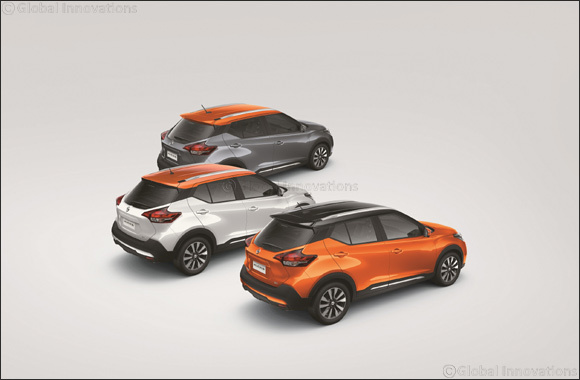 The Nissan Kicks was developed with the modern urban commuter in mind, with the aim of delivering the most innovative, stylish and functional crossover in its class. These commuters will appreciate the car's ability to deal with the rough and tumble of the urban jungle courtesy of its advanced chassis control technology. They will also love the ease of parking thanks to the Around View Monitor and the amazing functionality of the 7-inch color touchscreen. From the cosseting interior to the bold styling to the advanced technology, everywhere you look on the car there is evidence to back up why the Kicks is a big hit with young people all over our region. Nissan Intelligent Mobility uses smart, relevant technology to make the driver's life easier while also making advances towards Nissan's long term goal of zero emission and zero fatality motoring. Nissan Kicks targets young people who are early adopters of such technology and who appreciate and embrace the way it can both simplify urban driving and connect them more easily to what matters. The Intelligent Mobility technology present in Kicks aims to reduce stress for drivers through innovations such as the Around View Monitor (AVM) and the Moving Object Detection system (MOD). In terms of its visual appeal, Kicks features established Nissan design signatures such as the V-motion grille which dominates the car's front end. Also present are the boomerang head and taillights, and the “floating” coup�-style roof with a “wrap-around visor” look to the windscreen and side glass. The spacious interior too, is instantly recognizable as a Nissan design thanks to the “gliding wing” shape stretching the width of the dashboard.